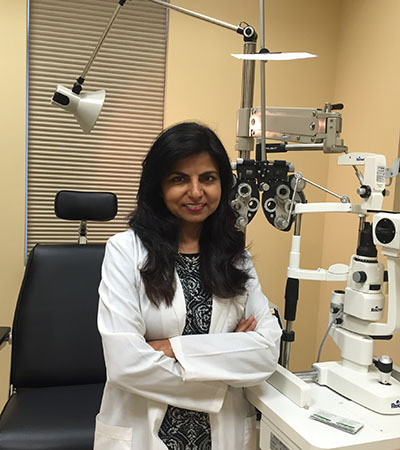 Dr. Ritu Kapoor has been providing family eyecare in the Sterling, Virginia area for almost 20 years. She attended the University of Maryland, College Park where she received her undergraduate degree with honors in Microbiology. She then obtained a Doctorate of Optometry degree from the distinguished Pennsylvania College of Optometry in Philadelphia, PA where she graduated with clinical honors. She has had many intern- and externships in research and clinical care including at the National Institutes of Health (NIH) in Bethesda, Maryland, and the Katzen Eye Group in Baltimore, Maryland. Dr. Kapoor is currently a member of professional organizations such as the American Optometric Association (AoA), the Virginia Optometric Association (VoA), Women in Optometry and others. She continues to stay involved in the latest in research & development, both in clinical research and new technologies.